EagleSticks Golf Club sprawls across gently rolling farmland in Zanesville. Dr. Michael Hurdzan designed the course, fully utilizing all the features of the scenic and diverse terrain. At a seemingly mild 6,500 yards, the course places heavier emphasis on accuracy over power. The raised tees, rolling fairways and undulating greens feature more than 100 feet of elevation change. The constant up-and-down of the golf course is one of the design's most difficult elements. In addition to providing plenty of natural hazards, the landscape offers endless scenery. Pristine forests of oak, ash, maple, locust, walnut, and cherry trees enclose nearly every hole. To make the scene even more tranquil, you'll also find a few cascading waterfalls. With both the beautiful setting and interesting design, it's no wonder that EagleSticks G.C. 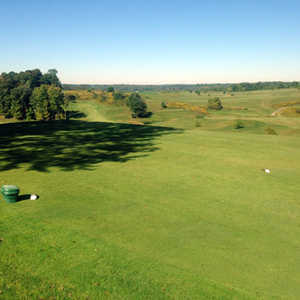 is considered one of the finest public golf courses in Ohio. $56 is a little pricey, especially when there are rocks in the green side bunkers AND almost no sand ! Also, when you can play Virtues (formally Longanberger) sometimes for as low as $44. In general I like the course but not for $56 . 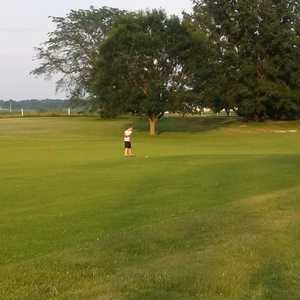 Probably the worst golf experience at a course in my life...a 6 hour round of golf on Saturday, August 16th. Four foursomes were on hole number 3 at the same time... and it got worse from there. It took us an hour and 40 minutes play 4 holes. The starter came by 2 times in the first 4 holes and his response to the question about pace of play was " that is weekend play.". Heard it from him about four more times while completing our 3 hr 45 min. front nine. At the turn, we asked the clubhouse attendant and he took the situation a bit more seriously. Found out the problem was a group rotating teams between several foursomes. The starter/Marshall could have stemmed this right away if he had taken the feedback from multiple groups seriously. Another foursome even called the clubhouse to report (maybe that is what finally created action). Instead, we were told repeatly that that pace of play was acceptable and "just weekend golf." So if you enjoy a six hour round of golf and being ignored by staff... Definitely play Eagle Sticks. Our group will not be back.